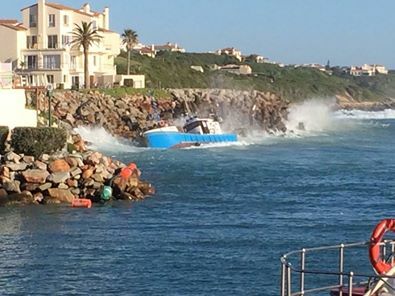 The chokka fishing boat, Sikelela, ran aground onto rocks at St Francis harbour entrance in heavy sea swells this morning. The 13 crew onboard managed to get to shore safely after the incident which occurred when the boat lost motor power as she was turning and navigating the harbour entrance in 5 meter breaking swells and a 10 to 15 knot westerly wind. The boat became engulfed by waves and was forced onto the rocks. 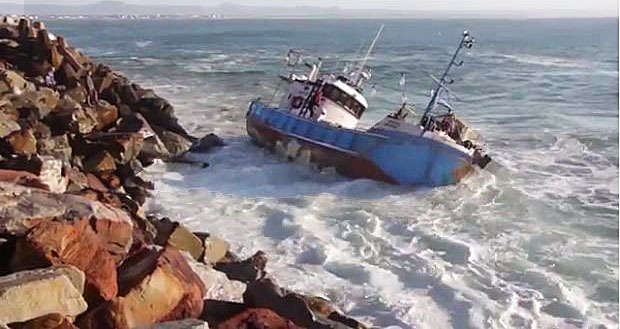 Eight crew of the stricken were rescued by the Baloyi fishing company TNPA tender harbour boat Ricochet while the chokka boat was being swept ashore and before she hit the rocks. When the chokka fishing boat washed up against the rocks there were only five men remaining onboard. One crewman, the First Mate, managed to jump ashore onto rocks. He was received by members of the public and escorted to paramedics when they arrived. Two crewmen were rescued by NSRI rescue swimmers and taken onboard the sea rescue craft Spirit of St Francis II. One crewman was rescued by Ricochet after the casualty boat had already washed against the rocks and Dolos. The Ricichet took him to shore before returning to rescue the skipper, Hutch McKenna, who was the last man to be rescued off the chokka boat.. This above is the updated information received at 15.20 pm today from NSRI media at NSRI H/O. This info has revealed an incredible feat achieved by the small Baloyi fishing company harbour tender rubber duck in rescuing 10 people off the stricken chokka boat and certainly averted a maritime disaster in conjunction with NSRI St Francis Bay rescuing the two crewmen from the water. According to station commander of NSRI St Francis Bay, Marc May, on 27 August NSRI St Francis Bay volunteer sea rescue duty crew were activated by the Transnet National Ports Authority (TNPA) at 7.41 am. “Our volunteer sea rescue duty crew launched our sea rescue craft Spirit of St Francis II and TNPA Port Control activated the private rubber duck, Ricochet, from Balobi Fishing. Private Care ambulance services, EC Disaster Management and EC Government Health EMS responded. “Exiting the harbour mouth both Ricochet and Spirit of St Francis II were faced with 5 meter breaking swells.” May said. “The casualty chokka boat was already up against the Dolos and against rocks and being battered by breaking swells crashing over the top of the casualty boat. Just after this, the casualty chokka boat then rolled in the swell and turned side on to the Dolos. The eight were received by members of the public, residents of the townhouses who went out of their homes to help. The eight were taken to safety and received by paramedics and Disaster Management officers who responded to the land side. Ricochet arrived on the sea side first, skippered by Lafran Toskie with crewman Kevin Bremner, who timed the incoming swell and managed to get their boat against the casualty chokka boat and two casualty crew were rescued off it and brought safely into port. Two crew and the skipper remained on board. When Spirit of St Francis II arrived at the boat it found the two crewmen hanging onto the side of the boat and being battered by waves. The men were clinging on for dear life. McKenna was standing on the top of the boat and a large wave crashed over the boat caused him to fall, lacerating his right arm severely. With no time to spare two NSRI rescue swimmers, Tantum Dace and Stuart Obrey, were deployed into the surf while coxswain of the sea rescue craft, Neil Jones, handed over the helm to Station Commander Marc May, so that Neil could direct the two rescue swimmers. The swimmers ordered the two casualty crewman to jump into the water and both were dragged by the rescue swimmers, through huge breaking swells, while skipper May timed the sets to bring the rescue craft into the danger zone and facing towards the waves and punching through the waves managed to rescue both casualty men onto the rescue craft. The casualy pair were received by NSRI coxswain Neil Jones and NSRI crewman Sarah Smith and hauled onto the rescue boat while May punched the boat through the incoming wave sets). By this stage Ricochet had returned to the scene with skipper Troskie and crewman, Craig ‘Short’ Humbee, onboard. They again managed, while timing the incoming sets, to bring their boat up against Sikelela and rescue McKenna off the chokka boat. This rescue was made difficult because he had been wrapped up in fishing lines, debris and flotsam) while the sea rescue craft picked up the two NSRI rescue swimmers. All were brought into the Port and all five casualty crew that had been rescued off the Chokka boat were handed into the care of paramedics. McKenna, who is a retired NSRI St Francis Bay coxswain, received stitches to his right arm for a laceration but otherwise none of his 12 crew were injured and were only treated on-scene by paramedics for shock and some observation for secondary drowning but all are safe and accounted for. The five rescued men were also treated for being submerged in motor diesel fuel that was in the water spilled from the chokka boat. NSRI Coxswain Neil Jones was deployed into the surf to attempt to put a tow-line to the casualty chokka boat but in the big swell the decision was taken to abort the effort. Salvage companies will investigate the possibility of a salvage effort once the sea swell subsides. 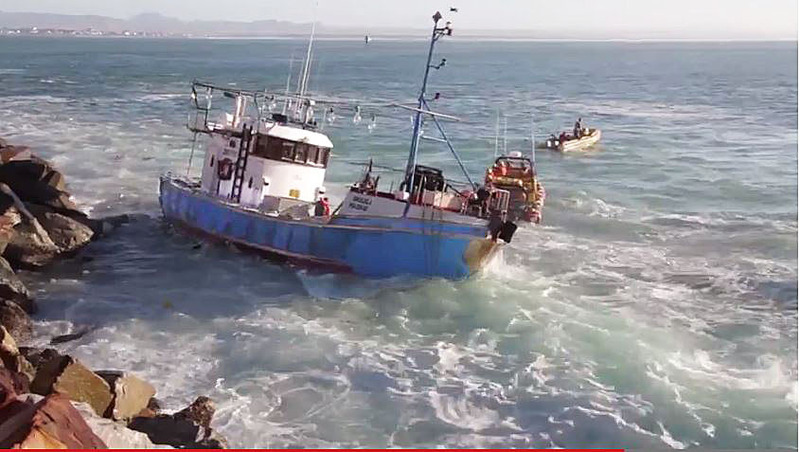 The entire St Francis Bay NSRI crew and the crew of the Balobi fishing companies TNPA Port tender boat RICOCHET are commended for saving the lives of the five crew, MNCKenna is also commended for staying on his boat despite a severe laceration injury until ensuring all 12 of his crew were safe and out of harm’s way. 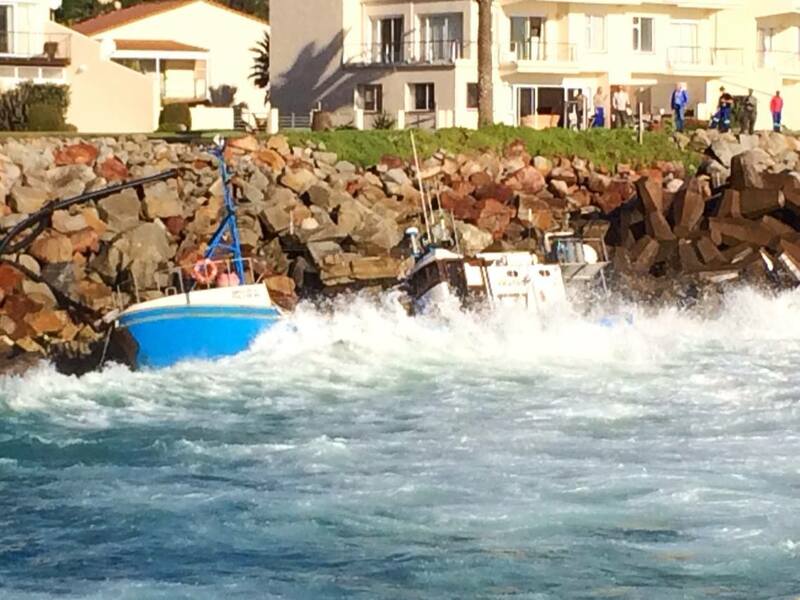 Photos of chokka boat run aground by Peet Kemp.